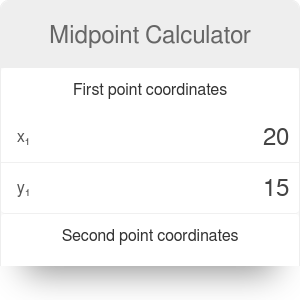 The midpoint calculator will take two coordinates in the Cartesian coordinate system and find the center. It's often useful in geometry. Before we can use the calculator, it's important to know how to find midpoint and what the midpoint formula is. Label the coordinates(x₁,y₁) and (x₂,y₂). Input the values into the formula. Add the values in the parentheses and divide each result by 2. The new values form the new coordinate which is the midpoint. Check your results using the midpoint calculator. Suppose we have a line segment and want to cut the section into two equal parts. To do so, we need to know the center. We can achieve this by finding the midpoint. You could measure with a ruler or just use a formula involving the coordinates of each endpoint of the segment. The midpoint is simply the average of each coordinate of the section, forming a new coordinate. Let me illustrate it below. If we have coordinates (x₁,y₁) and (x₂,y₂), then the midpoint of these coordinates is determined by (x₁ + x₂)/2, (y₁ + y₂)/2. This forms a new coordinate you can call (x₃,y₃). The midpoint calculator will solve this as well by entering the coordinates. Follow the steps below if calculating by hand. For small numbers, it's easy to calculate the midpoint by hand, but with larger and decimal values, the calculator is the simplest and most convenient way to calculate the midpoint. Just as finding the midpoint is often needed in geometry, so is finding the distance between two points. The distance between two points on a horizontal or vertical line is easy to calculate, but the process becomes more difficult if the points are not aligned as such. This is often the case when dealing with sides of a triangle. Therefore, the distance calculator is a convenient tool to accomplish this. In some cases in geometry, we wish to inscribe a triangle inside another triangle, where the vertices of the inscribed triangle lie on the midpoint of the original triangle. The midpoint calculator is extremely useful in such cases. Midpoint Calculator can be embedded on your website to enrich the content you wrote and make it easier for your visitors to understand your message.